The class was using the Bonnie Hunter techniques to work on two projects at the same time. Bonnie has a load of quilting information on her website… free patterns, tips, etc., so got to http://quiltville.com to check it out. 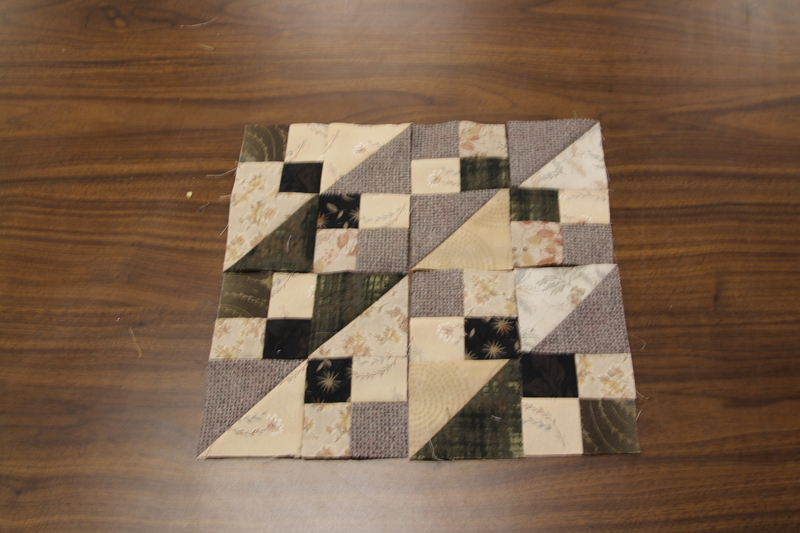 The main project is a free pattern on Bonnie’s website called Scrappy Trip Around the World http://quiltville.blogspot.com/2005/06/scrappy-trips-around-world.html and here is a photo of many of the blocks from many of the students. Notice how well the blocks blend together, and although we each have different fabrics in our stash… the blocks are very harmonious. It is pretty easy to do, and a great way to create something useful out of your odds and ends, or scrap basket. You should give her technique a try. At the same time, we were sewing using the Leaders and Enders technique to work on blocks for a second quilt… this one from the book called “Leaders and Enders” from Bonnie Hunter. The Blue Ridge Beauty quilt is shown in the book in lovely blues and tans, however, I’ve had this collection of Daiwabo fabrics for several years now, and this seems like a perfect choice for this pattern. I only got a few blocks done in between strips for the scrappy quilt, but here is a peek at them. Aside from that, I’ve got the Quilts of the Plains this coming Saturday, June 23rd. I decided a week ago to pull out a quilt top that I pieced AT LEAST 16 years ago, called Burgoyne Surrounded. 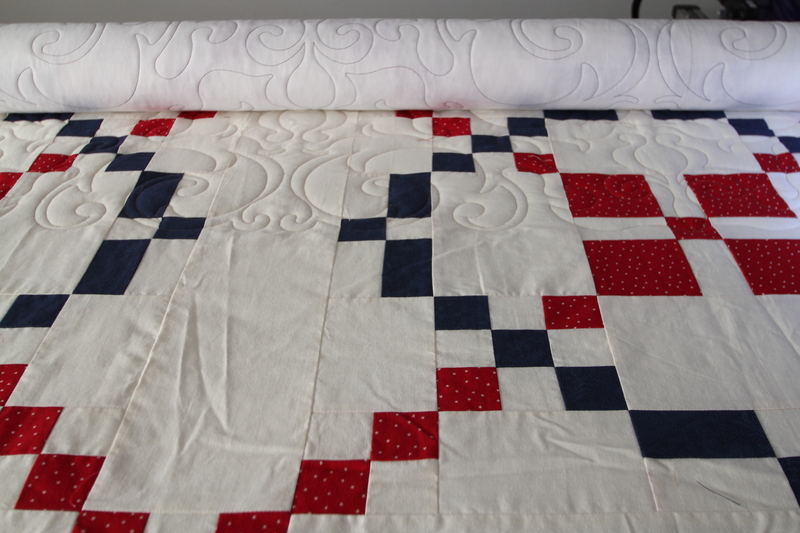 With Independence Day right around the corner, the patriotic nature of this quilt made it jump to the front of the line. I have another quilt in the show… but, if only I could quilt this up, and get it bound, I could have another, right? Here it is on the machine, and you can see the design… however, come to the show to see the whole thing. 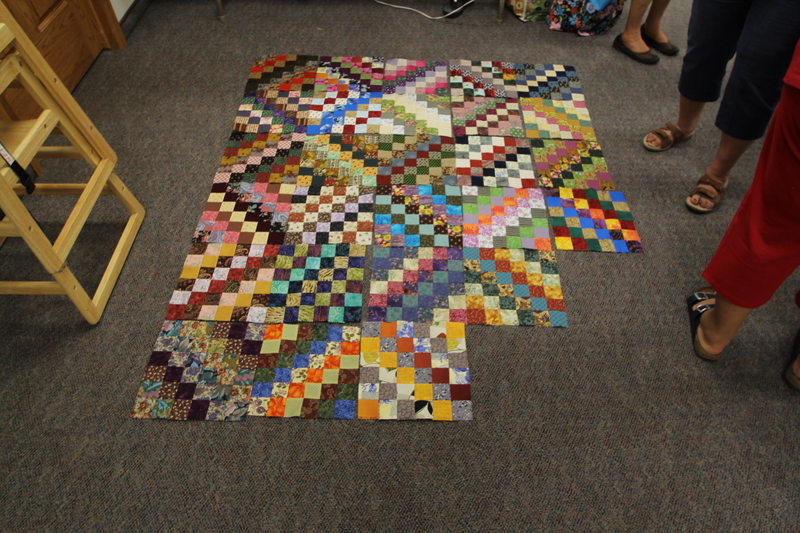 The quilts are coming in… and there are some beauties!!!! I hope you’ll join us in Wray on Saturday. Don’t forget to vote for your favorites, buy some raffle tickets, and bid on the great items at the silent auction. This event helps raise funds for the Chamber of Commerce for all the events it offers throughout the year. visit www.wraychamber.net/quiltsoftheplains.php if you want more details.